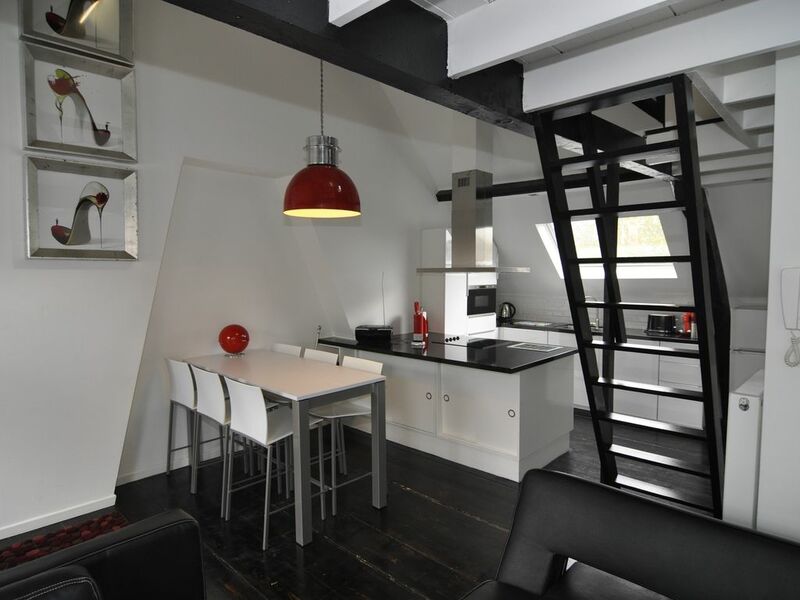 Ideally located in a quiet street just 750m from historical center of Ghent is this 40m2 duplex studio, ideal for 4 persons, 5 is possible upon demand. The kitchen is equipped with stove, microwave, dishwasher, refrigirator and freezer. Bathroom with rain shower and towelheater. Free WIFI, Samsung flatscreen. 2 Bedroom apartment has Queen size box spring bed (160m by 2M, 2 single beds and a queen size sofa bed in living area (1,60 m on 2 m). Bedlinen included, towels can be rented upon request. Quiet street, at walking distance to major attractions of Ghent. A few kilometers from Flanders Expo, the Blaarmeersen recreation center No need for car, but if you come by car,parking in our street and surrounding streets only costs 6 euro per day. Above the fridge, there is a seperate small freezer for ice and storage of frozen items like pizza's. Originally, I had confirmed a 1 BR place from the same owner, that turned out to be not available, and offered a different place. I did not understand that it was a studio...(my fault- I did not read close enough the description), however, the pictures sent along seemed to suggest a larger place. In any case, the place was nicely located, and well appointed, and well, small! clean, close to center, honest friendly owner.We enjoyed our stay. I booked this stay, for my boyfriend and his friends for his 30th birthday. For 6 people, is was just right. Cosy interieur, near the the citycenter and especially very kind and helping owners. I wanted to surprise my boyfriend with some smal presents, were the owners were very helpful. I hope to come back to enjoy the stay myself!! Op een 7 minuten loopafstand van het historische centrum van Gent bevindt zich dit appartement. Waar op dat moment een grote, gezellige kerstmarkt met ijsbaan en reuzerad was. De restaurants zijn volop aanwezig. Een twee minuten verder lopen en je staat midden in het shop gedeelte van Gent. Wij (vier volwassenen) zaten in het appartement met twee slaapkamers. Het is een modern appartement, waar echt alles aanwezig is. Het was schoon, gezellig en voldeed aan al onze eisen. Wij hebben een zeer gezellig weekend in Gent mogen beleven. Très agréable séjour dans cet appartement bien situé : des places pour se garer (6€/ 24 heures)de quoi faire ses courses et le centre-ville à 10 minutes à pied. D'agréables attentions: Café ( Senseo avec dosettes), produit lave-vaisselle, savon... C'est agréable de ne pas avoir à tout acheter en arrivant! Perfect for citytrip to visit Ghent and neighbouring cities like Brussels (60km) Antwerp (70km) Bruges (40km). Easily accessible by public transport or car.